Although it reflects very low risks but, that can turn into major bottleneck and could cap the growth of your online marketing and communication business. We absolutely understand the importance of maintaining your website and specialize in offering to our clients Website maintenance and management services. We believe in building long-term customer relations rather than one-time service delivery association. Our business model is focused as strongly on repeat business from existing Clients. The technology revises on the continuous basis and so are your services for your customer over the same. We care for your business values and hence are available with you to continuously update your website. We believe in long term professional relationship with our clients and let them extend their concentration over the business by taking the entire responsibility of support and update the website as per their growth. We are well known in the market for our reasonable support services which has got us 500 clients across several countries as permanent clients. All this is made possible through excellent service delivery and a strong after-service support. To add on to this, we allocate a dedicated Account Manager with clients who are our partners. These account managers are accessible for clients for any complicated support needed. 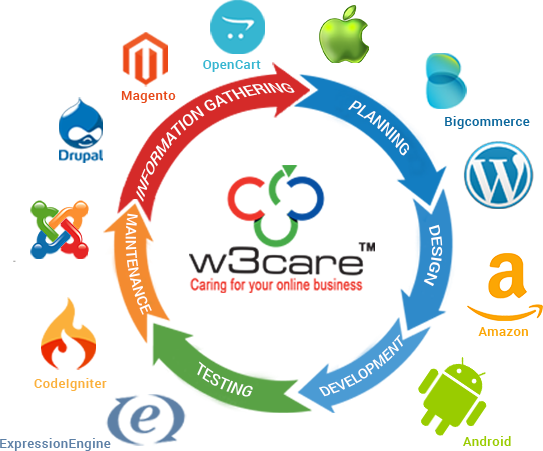 We at W3care Technologies are dedicated to our work of website and mobile app development. We have individual teams for development, designing, and maintenance. Our core motive is to provide satisfaction to clients at any cost in time. Website maintenance is very important after deployment to keep it perfectly working. We also provide dedicated support to our clients through email, Skype, and telephonic as well. W3care has done great work for us. Our projects have involved xhtml, css, ExpressionEngine, and Google Maps. They've done very skilled work on all aspects of the projects. What's most outstanding about this company, though, is their great communication on projects. Communication is done in a very clear and timely way, so you know you'll always have excellent follow-through on your projects. I highly recommend them.